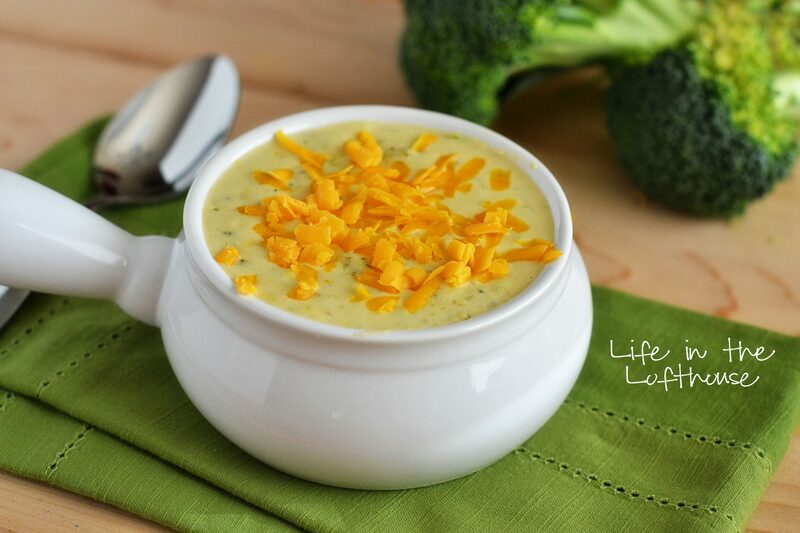 The most delicious Broccoli Cheese soup you will ever eat! In a large pot, over medium-high heat, add the vegetable (or chicken) stock, the chopped broccoli, carrots, onion, garlic and bay leaves. Stir and cook mixture for 20 minutes, or until veggies are tender. Once tender, remove the bay leaves. In a separate large pot, melt the 6 Tablespoons of butter over medium heat. Slowly whisk in the 6 Tablespoons of flour. Once mixture is golden then pour in the broth and veggies. Continue to whisk mixture to incorporate the roux. Stir in the 2 cups of half and half and stir to combine mixture. Sprinkle in the garlic salt, nutmeg, basil and cayenne. Reduce heat to medium-low and simmer soup for 20-30 minutes or until thoroughly heated. Stir in 1 cup of the cheddar cheese and all the gouda cheese. Remove from heat. If soup is too thick, you can thin it out with a little milk or water.